I'm a Northern boy who's spent most of his life down South! I was born in Endicott, New York in 1967. My family left there when I was four and we moved to the rolling countryside of Lancaster, Pa. In the Summer of 1979, my Dad was transferred with his job at IBM, so we migrated down South to Atlanta, GA. settling in the Marietta area. After graduating from High School, I attended The Savannah College of Art and Design majoring in Illustration. Savannah was a wonderful place to go to school. It's the largest Historic District in the U.S. and is full of beautiful old homes, churches, parks, and monuments. I returned to Atlanta after college to work for a talented gentleman who ran a multi-media business producing corporate videos, slide shows and in-house graphics. I had the pleasure of also working on developing an animated cartoon that, unfortunately, was never produced. But, it was a heck of a fun experience designing characters, sculpting models, and working on storyboards. After leaving that job, I found myself a manager for Pearl Art Supply in Atlanta. I oversaw the Technical Department which consisted of all the graphic art supplies, portfolios, fine writing pens, and airbrushes. It taught me alot about art materials -- even more than I already knew from college! There I met my good friend, Kris Meadows, who was also teaching at some of the local art centers and colleges. He convinced me to show my work to the various directors of the schools and see if it might be something I'd enjoy doing. So, I followed up on his suggestion, and was accepted into the programs at The Atlanta College of Art and The Spruill Center for the Arts. Since then, I've expanded my roster of classes to include Intro to Drawing, Portrait Drawing, Polymer Clay Sculpting, and Sequential Art(Comic Book Illustration). 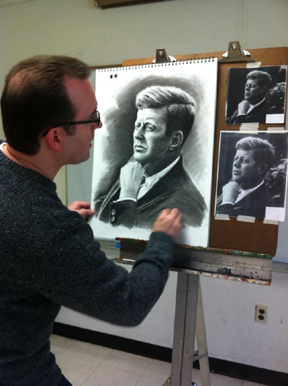 I've also taught courses at other Metro Atlanta schools such as The Roswell Visual Arts Center, The Chastain Arts Center and Emory University. Some of my artistic influences include the great portrait painter John Singer Sargent, Joaquin Sorolla, Gustav Klimt, Alphonse Mucha, Edgar Degas, N.C. Wyeth, J.C. Lyendecker, Norman Rockwell, Paul Calle, Drew Struzan, and from the world of comic art, Neal Adams, Mike Mignola, and Steve Rude.